Featured photo by m01229 via flickr. Used under a CC-BY-2.0 license. 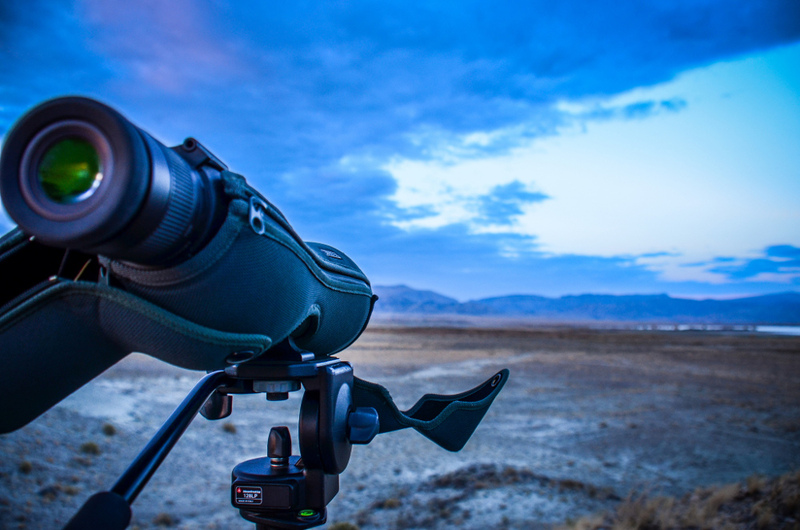 The best budget spotting scope can be use for surveillance, bird watching, hunting, verifying a shot to zero in guns, or whatever purpose that calls for more magnification (to the power range of 20x to 60x) than a handy pair of binoculars can offer. 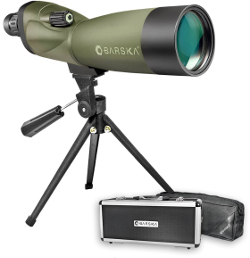 Inexpensive spotting scopes come in a variety of brand names, models, sizes, magnification and, of course, price. They’re also available in straight or angled eyepiece mount. These scopes range from a hundred to over a thousand bucks. For the budget conscious, we’re putting forward some affordable scopes under 300 dollars. Barska’s Blackhawk straight spotter comes with generous fog-proof and water-proof protection, ideal for all-weather conditions. It boasts of a multi-coated optics with a large objective lens for enhanced light gathering ability that provides crystal-clear images during light-starved situations. Blackhawk’s magnification power of 20x-60x delivers a wide field of view for varied applications, which translates to about 91 feet at 1,000 yards and 45 feet at 1,000 yards. It features a retractable sun-shade that helps reduce glare, and is reinforced with shock-absorbing rubber armor for maximum protection and durableness. The kit includes a soft carrying case, a premium hard side aluminum case, and a panhead lever tripod, which makes for easy mobility. The Blackhawk spotter is also available in an angled eyepiece system that costs just a bit higher, with practically the same features and performance, plus an added limited lifetime warranty on both products. Check out this Rampage spotting scope by Redfield: It magnifies an object 20x-60x, has a field of view of 51-114 feet at 1000 yards, and generous eye relief of 14-17mm – all these make the perfect balance between magnification and field of view under various conditions. The kit includes a sturdy tripod and tripod adapter port, for easy installation on standard tripods or window mounts. 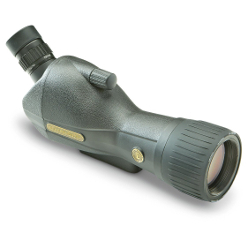 These great features are housed in a polycarbonate body that makes the scope lightweight but durable. It is packed with a retractable anti-glare lens shade, a fully multi-coated optics with an exceptional BAK4 prism that delivers crisp and clear image, lens covers, a soft carry case, a twist up/down eyecup for convenient use with or without glasses, and a neoprene neck strap for easy tote. 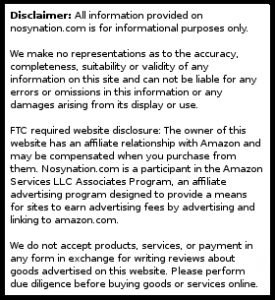 The product is covered by a manufacturer’s limited lifetime warranty. The Leupold SX-1 Ventana is an angled spotter from one of the leading manufacturers of high-end optics. The fully multi-coated optics guarantees superior light gathering capability with maximum illumination, clarity and contrast. And the knurled design knob on the focus and lens shade should give you a firm hold, even with gloved hands, for accurate adjustments. For quality image enhancement, Leupold offers a retractable lens which reduces glare, and a large eye relief with twist-up eyecup, ideal for prolonged stakeouts or observation periods. The 15x-45x magnification of this scope works at corresponding field of view of 142ft-89ft. With tough construction and heavily sealed optics, this spotter is guaranteed 100% water-proof and fog-proof to hold out against extreme conditions. Leupold’s Ventana kit has provided some extras like a soft case, sturdy strap, and lens cover. Truly, this angled spotter works great and ideal for hunting, bird watching, and zeroing in any of your rifle scope. The scope’s awesome features may not be as perfect as those thousand-buck scopes but it’s a good cheap spotting scope. 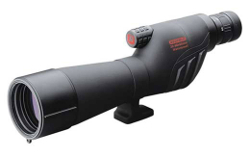 What is the best spotting scope for hunting? For many gun experts, spotter scopes with magnifications of less than 20 times aren’t as useful in the field as are magnifications in excess of 60 times. Beyond 60x, illumination will be weaker, field of view will be narrower, and there’s the likelihood of excessive image shaking even when using a tripod. As target image magnifies, so will dust particles, heat mirage, moisture and haze magnify. Barska’s Blackhawk and Redfield’s Rampage have similar level of magnifications that fit the 20x-60x norm, while Leupold has a bit lower magnification at 15x-45x. Both Redfield and Leupold provide fully-multicoated optics, while Barska could only deliver multi-coated lenses. All other characteristics and features, such as light gathering, construction and materials used, the three contenders share the same great performance. Find the best budget spotting scope in 2019 on Amazon. Previous articleMotorcycle throttle locks: Cruise control!